For many in America, schedules leading up to the winter holidays are filled with shopping, food prep and taking family pictures for the annual greeting card. But on Saturday, Dec. 16, 2017 — at 1,422 participating memorial locations nationwide — time stopped as grateful Americans in every state placed more than 1,565,000 remembrance wreaths in tribute to our fallen soldiers. 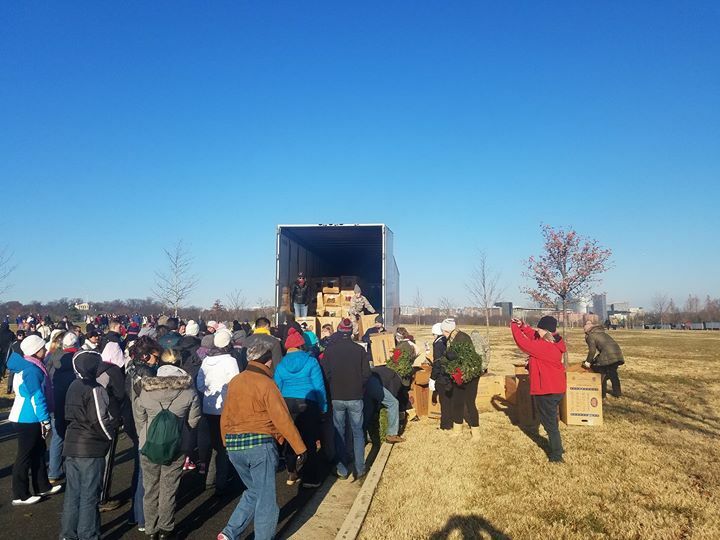 Three Schneider drivers and one Schneider Owner-Operator were among those undertaking this meaningful, solemn task as part of their participation in the annual Wreaths Across America event. Wreaths Across America dates back to 1992 when Morrill Worcester, President of Worcester Wreath Company in Harrington, Maine, discovered he had a surplus of wreaths nearing the end of the holiday season. Remembering an experience at Arlington National Cemetery when he was 12 years old, Morrill worked with a number of other supporters to make arrangements for the extra wreaths to be placed at an often-unvisited part of the historic cemetery. Though planned as a one-time event, that initial wreath laying launched an official organization. For the last 25 years (and counting! 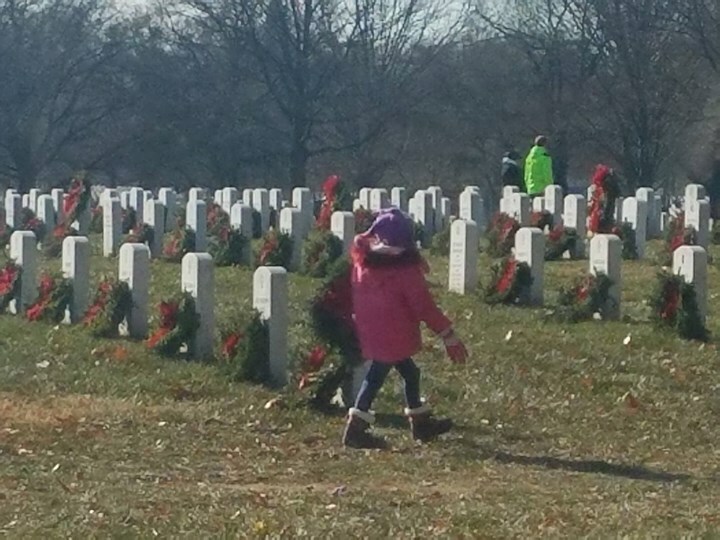 ), thousands of volunteers have placed holiday wreaths at the graves of veterans and fallen soldiers across the nation, around the globe and at sea in spirit of Wreaths Across America’s mission: “Remember” our fallen U.S. veterans, “honor” those who serve and “teach” children the value of freedom. 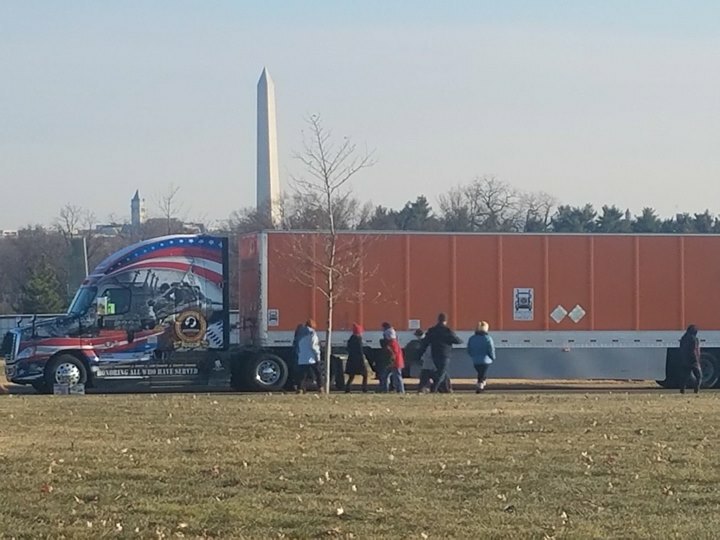 Like many Schneider Ride of Pride drivers before him, this year’s driver, David Price, and his truck, dubbed The American, participated in Wreaths Across America by hauling a truckload of wreaths to Arlington National Cemetery. Price joined the military after 9/11 (at the age of 38) and then spent the next 14 years serving as a member of the Navy Seabees, but had never been to Arlington National Cemetery. A few days before the wreath laying ceremony, The American — along with more than 500 trucks — arrived at Worcester Wreath Company in Harrington, Maine, to pick up their special loads of fresh balsam fir wreaths. In addition to trucks hauling the special wreaths, the convoy included multiple vehicles to transport American Gold Star Mothers, Blue Star Families, Gold Star Wives, veterans and Wreaths Across America supporters to various national cemeteries. Members of the Patriot Guard Riders, Patriot Riders of America and Rolling Thunder, along with law enforcement from Maine, escorted the convoy to ensure safe transport for all participants throughout the week. 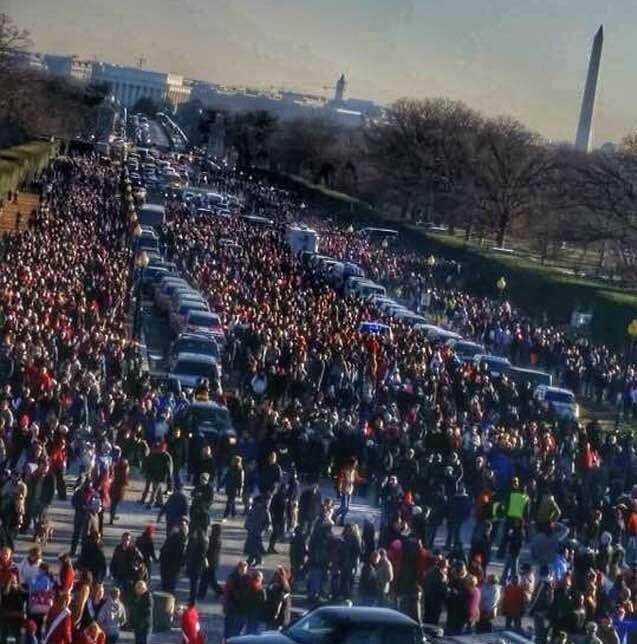 At one point, the convoy stretched for more than 4 miles. It didn’t take David long to realize how massive, energizing and emotional of an event Wreaths Across America is. 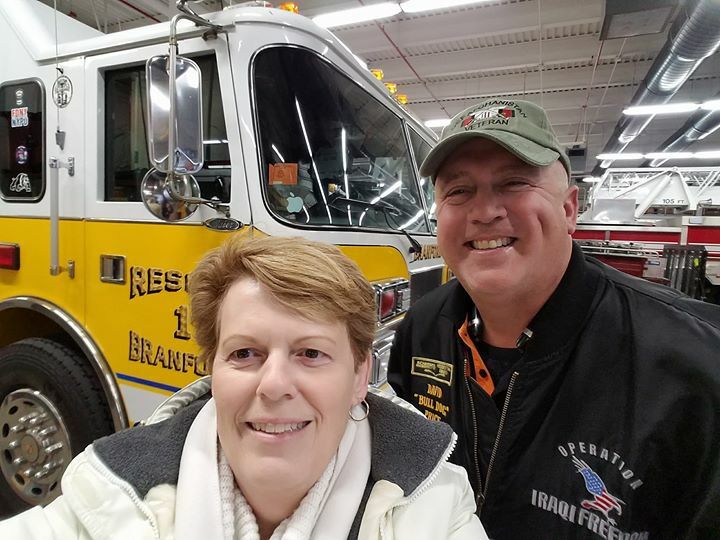 “Whether your load is destined for Arlington or any other national cemetery, you’re getting to know first responders and families of fallen heroes, seeing flags draped … everyone becomes a family,” David said. David wasn’t the only flash of orange in this year’s red, white and blue convoy starting in Maine: Schneider’s 2016 Ride of Pride driver, Jon Ritscher, the current driver of the 2013 Ride of Pride, Charles Scott, and David Blevins, Owner-Operator for Schneider, drove alongside David and The American for part of the journey. For Jon, it was a beautiful reminder of his experience in 2016, although this year his destination was Sarasota National Cemetery. Charles was equally humbled by the people he met along his route to the Florida National Cemetery in Bushnell, Florida. David Blevins, whose route took him to Houston National Cemetery, has been hauling wreaths for Wreaths Across America as far back as he can remember. Blevins is continually amazed at the number of volunteers, reminding him that there’s still hope and people who care out there. In all of Wreaths Across America’s history, the Ride of Pride has never been the leading truck into Arlington. That changed in 2017 as David and The American escorted a mile-long convoy of vehicles into the cemetery. The convoy included decorated tractor-trailers, buses and cars carrying wreaths, veterans, Gold Star and Blue Star families and supporters. In Arlington alone, 244,700 wreaths (one for each marker there) were placed by more than 75,000 volunteers — the largest crowd to date. 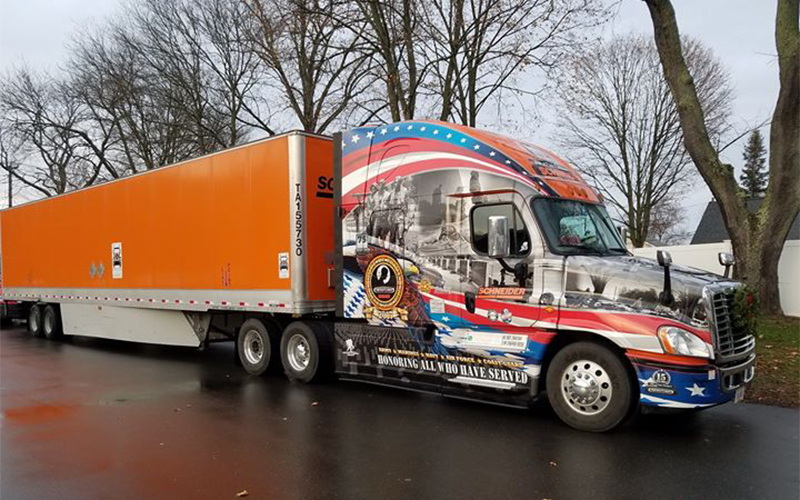 For a greater glimpse into Schneider’s experience with Wreaths Across America, be sure to visit the Ride of Pride Facebook page. Beyond seeing pictures of the Ride of Pride and the Arlington Cemetery, you’ll read stories of David Price’s experience, like meeting with Gold Star mother Molly Morel (pictured) whose son Brent paid the price for our freedom. For Gold Star families — like the Morels — the holidays are tinged with sadness as they remember prior years spent with their loved one. Now, they buy gifts for one less person, set the table for one less person and have a giant hole in the family photo. It’s events like Wreaths Across America and participants like Jon Ritscher, David Price, Charles Scott and David Blevins that remind these families that they are not alone in their grief. In fact, this event helps us all remember and honor the lives of those who fought for our freedom. If you’ve served, thank you! Other ways we show support. Learn more about how Schneider supports our military associates through pay, benefits, flexible home time and more. Have you ever been involved in Wreaths Across America or directly impacted by it? We’d love to read your comment below.